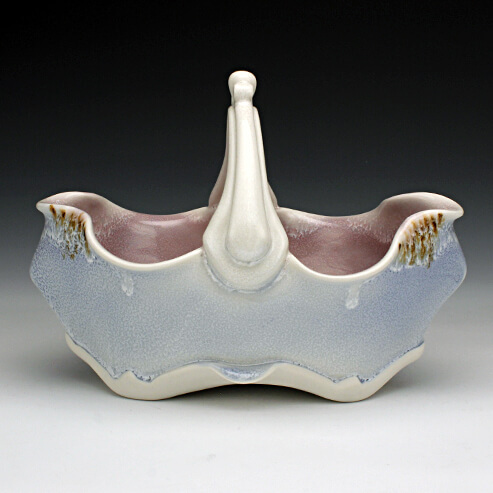 Martha Grover is a functional potter, creating thrown and altered porcelain pieces. She attended Bennington College in Vermont, where she received her undergraduate degree in Architecture. After going to Syracuse University in New York as a fifth year student in Ceramics, she decided to pursue a graduate degree in clay. In 2007, Martha received her MFA in ceramics from the University of Massachusetts Dartmouth. Since then she was awarded the Fogelberg Fellowship for a nine month residency at the Northern Clay Center in Minneapolis, Minnesota, and the Sage Scholarship for a summer residency at the Archie Bray Foundation in Helena, Montana. Martha completed a year long residency at Red Lodge Clay Center in Red Lodge, Montana in August 2009. She is currently at Archie Bray Foundation where she has received the Taunt Fellowship. Her work can be found at the Red Lodge Clay Center, the Archie Bray Foundation, the Newport Potters Guild in Rhode Island, the Clay Studio of Missoula, ArtWorks! Gallery in New Bedford MA, Schaller Gallery, Charlie Cummings Gallery in Gainesville Florida, and the Holter Museum of Art in Helena, Montana. Her work has been published in Ceramics Monthly, Clay Times, 500 Pitchers, and 500 Platters and Chargers.